If you want to have your property removal conducted with the fewest possible hassles and costs, then by all means choose from our range of quality, cost effective removals Bethnal Green based households and businesses will have their relocation taken care of in the most professional and efficient manner. In our opinion as a professional moving company, there are a number of essential factors that make a good removal service and we have ensured to incorporate each of these and provide a better service at a better price. All work will be carried out by specially trained movers and experienced drivers who will work in perfect sync with one another as to ensure timely completion and no unexpected setbacks. For more efficiency and reliability all removals are coordinated through our call centre. The company has full liability insurance – extra peace of mind is always good. In order to ensure flexible and efficient transportation on all jobs we maintain a large number of specially equipped cargo vehicles of different size and load capacity. Our vans are cleaned after every job, fitted with working satellite navigation and all the latching and hoisting equipment required for heavy lifting. Our range of removals in Bethnal Green is the most efficient and sensible way to move your items from A to B without margin for error. All customers will receive adequate technical advice during all stages of the removal. 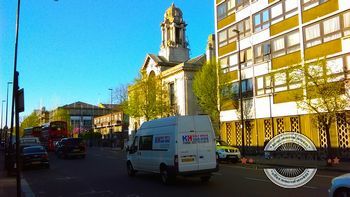 Since you won’t have to deal with the usual nuisance removal chores as our mover teams will do it for you, take the opportunity to explore the history and character of Bethnal Green. The area is relatively close to the city’s central districts. Originally Bethnal Green was an agrarian settlement with its main economy being market gardening. A little while later, weaving and certain forms of light industry became the dominant economy in the district. Although local economy was in good working order, housing stock and amenities in Bethanl Green were lagging or non-existent around the start of the twentieth century. There were slums forming. WWII bombing raids brought a lot of devastation to the area, which also signalled the dire need for change and regeneration of Bethnal Green. There are a number of places of interest in the bounds of modern day Bethnal Green, perhaps one of the better known ones is the Victoria & Albert Childhood Museum.